Does your sushi contain parasites? 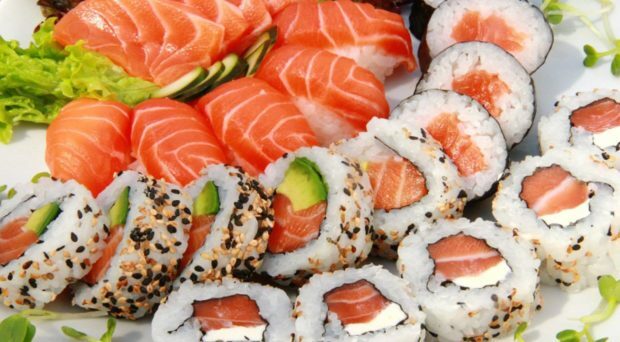 The increase in the popularity of eating raw fish in sushi and sashimi dishes has been blamed for a parallel increase in cases of anisakiasis. This painful stomach infection is caused by a group of parasitic round worms belonging to the genus Anisakis. Eating raw or undercooked flesh can be hazardous as this is the route by which several groups of parasites gain access to humans. These include tapeworms and roundworms that take up residence in our guts or burrow through into our blood system and are carried round to invade other organs of our body. Many people are aware that beef and pork could be contaminated with the larvae of tapeworms, especially in countries where sanitation standards are poor, but fish are not considered a source of parasitic infection so often. However there are examples of both tapeworms and roundworms whose larvae live in the muscles of fish and develop into mature worms in animals that feed on infected fish, including humans. One such group of parasites are the anisakid nematodes. These nematodes have a complex life cycle with several hosts. Adult worms live in the intestine of marine mammals. Here they feed, grow and mate to produce eggs. The eggs pass out with the faeces and when the eggs reach saltwater larvae develop whilst still inside the egg. Here they moult to second stage larvae then the eggs hatch. If the free swimming larvae are then eaten by their first hosts, which are crustaceans, they moult again to third-stage larvae. They move up the food chain if their crustacean hosts are predated by squid or marine fish and here they migrate through the gut wall and form a cyst on the wall of organs or in the muscle. At this stage they are coiled in appearance and about 2cm long. Their final journey occurs if these hosts are then eaten by marine mammals such as dolphins or whales and the cycle is completed. The larval stage infective to marine mammals can also infect humans. Infective larvae have been found in wild salmon, mackerel, herring and halibut as well as squid. 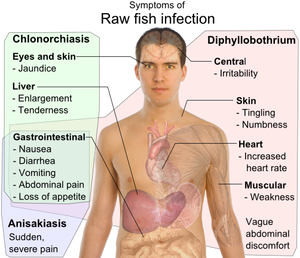 In addition to eating raw or undercooked fish in dishes such as sushi or sashimi, people can be infected by eating lightly pickled or salted fish such as fermented herring in the Netherlands, marinated anchovies in Spain or cod livers in Scandinavia. To avoid infection, fish need to have been frozen to below -20°C for several days or cooked at a temperature of at least 60°C. Many countries require fish to be frozen before sale to avoid the danger of infection, especially as most domestic freezers do not reach these low temperatures. Anisakiasis, also known as herring worm disease, is caused by Anisakis simplex. It was first recognised in the 1960s and predominately occurs in countries were raw or undercooked fish forms a large part of the diet. More than 1,000 cases are reported annually in Japan. The Anisakis larvae try to burrow into the wall of the stomach or intestine but the thick wall prevents complete penetration and the larvae usually die there causing an immune response that produces a mass of tissue that could block the intestine. Symptoms include acute abdominal pain, nausea, vomiting, and mild fever. Allergic reaction such as rash and itching can occur and infrequently the response can cause anaphylaxis. A recently published case study in the British Medical Journal reported the removal of a roundworm from the stomach of a man who had been suffering with mild fever, vomiting and acute stomach pain. The worm was discovered during an endoscopy examination attached to a swollen area of the stomach lining and removed with a Roth net. These nets are usually used to remove polyps or foreign bodies from the stomach. The worm was identified as a member of the genus Anisakis. Once the worm had been removed the patient’s symptoms disappeared. This patient was fortunate, if the worm is not removed symptoms such as peritonitis can occur or an immune response could have caused anaphylaxis. Is the risk of infection really increasing? An excellent study, published in 2005, assessed the risk of acquiring fish or wild-meat -borne infection in Asia concluded that the apparent increase in infection may be due to better diagnosis. The authors found the type of fish used in the preparation of dishes in Japanese restaurants and sushi bars were usually parasite free but warned that fish, wild-meat and squid sold in markets in rural areas for home consumption or for local restaurants or street food shops were heavily contaminated. They suggested travelers to Asia should be made aware for the risk of eating raw or undercooked dishes. In contrast, recommendations by European Union regulatory bodies and the US Food and Drug Administration concerning the freezing of fish prior to consumption should, in general, protect diners in Japanese restaurants and sushi bars in these areas. So perhaps lovers of sushi in the West can relax. Could carbamate insecticides save the day? and readinhg very informative articles or reviews here. I’m trying to find out if I am infested (or infected) with helminth(s). I swallowed a morsel of Atlantic salmon flesh, whilst slicing a whole fish, ready for freezing. After removing a fish steak, I discovered a heminth in the flesh. It was, in fact, two worms attached to each other; a plump one and a slender individual. They had crawled out of a tunnel they had dug out of the fish’s flesh, whilst being frozen. I am scared that I swallowed eggs if there were any. I don’t think I ate a worm. I could not identify the worms. I don’t know if they are nematodes or cestodes. One of them appeared to have a scolex or similar appendage. The only symptoms I observed was a change in texture of my excrement. I went to my family doctor (GP), but she didn’t prescribe anthelmitic drugs. Can anyone help. I worry.